Sponsored article: The Weidt Group discusses how energy-saving measures improved a school in Denver. When selecting energy-efficient solutions for a new, high-performance building, the future occupants are just as important to consider as the structure itself. This approach is exactly what made the Rocky Mountain Deaf School (RMDS) in Denver so effective. With a long and distinguished history in Colorado, RMDS is dedicated to providing first-class education for deaf and hard-of-hearing children and young adults. In 2011, RMDS was awarded a BEST Grant to create a permanent, functional and beautiful school optimized to serve its students. Denver-based firm AndersonMasonDale Architects designed the first-class facility to match RMDS’s educational mission for PreK–12 students. With a budget of $9.9 million, the one-story, 46,000-square-foot facility was completed in August 2014. Primary educational components include classrooms, art rooms, science labs, a library media center, audio testing rooms, occupational and physical therapy rooms, computer rooms, an auditorium and a gymnasium. Support spaces include conference spaces, a cafeteria, a kitchen, multi-purpose spaces, a courtyard and administration facilities. AndersonMasonDale Architects teamed up with The Weidt Group to incorporate energy-efficient strategies throughout the school and to pursue LEED certification. 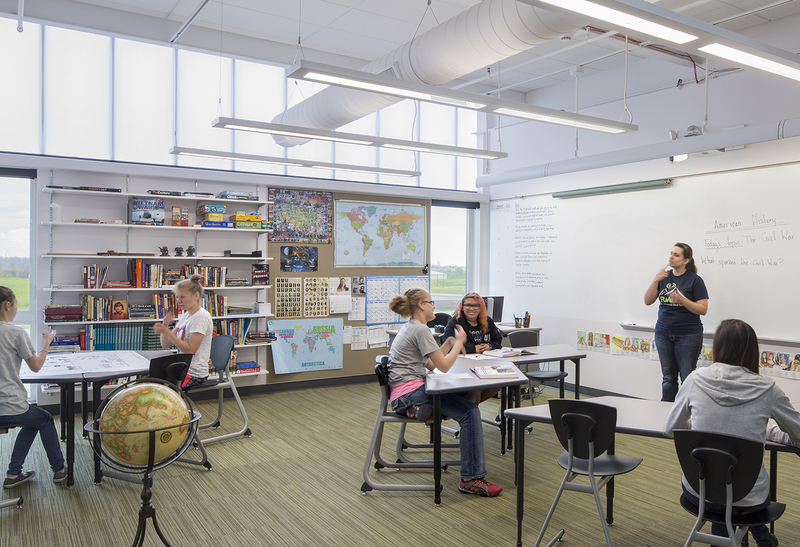 The three most prominent solutions—in-floor radiant heating and cooling, LED lighting and daylighting—are unique because not only do they save energy, but they also serve a distinct and direct benefit to the students themselves. The in-floor radiant heating and cooling was utilized for several reasons. Temperature variance and excess air movement affect hearing-impaired students. The in-floor radiant system minimizes temperature variance and air movement, thus providing a better learning environment for the students. Temperatures are more uniform because the system provides warm and cool air from the floor, which is closer to where the students “live.” Also, with this system, the ventilation air maintains low velocity because only that quantity of air is introduced, making it much lower than what would be expected from a full airside conditioning of the space. The system also makes sense from an energy perspective. These floors result in 5 percent energy savings over more traditional heating and cooling strategies. As such, this strategy alone represents approximately 15 percent of the school’s total combined energy cost savings. When this project was being designed, LED lighting was still very expensive. However, the project team worked hard to incorporate a significant amount of LED lighting to save energy. In addition, the light levels had to be high at both the teaching wall and throughout the classroom. This is very important so that students and teachers can easily see each other signing. The LED lights reduced the classroom LPD from 1.12 W/sf to 0.73 W/sf. 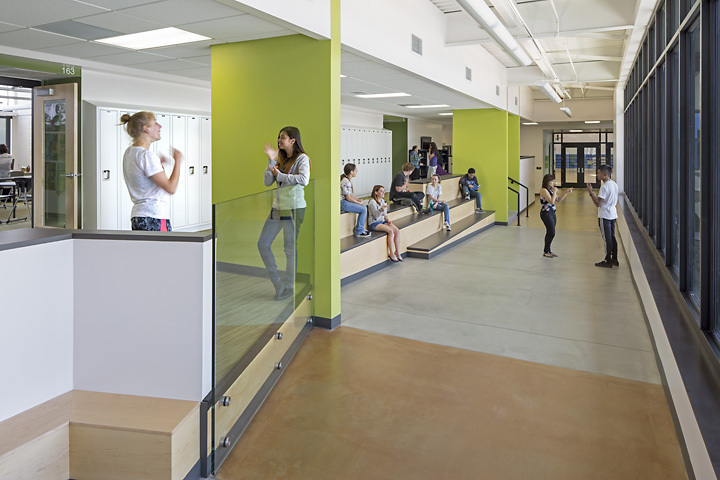 Daylighting is another essential element to consider when designing a school for the deaf community. When one sense does not fully function, other senses compensate. For members of the deaf community, their eyes work extremely hard because they communicate visually with sign language. To avoid additional pressure on the eyes, buildings need to introduce just the right amount of daylight—not too much, not too little. Additionally, the location of daylight sources must be carefully selected so that sunlight does not enter the building behind the location of where people sign. Otherwise, the backlighting will limit or prevent a person’s ability to see another student or teacher signing. To ensure an optimal learning environment and capture full daylight potential, direct sun penetration was mitigated by locating classrooms on the north side of the building, incorporating translucent glazing at the clerestory windows, as well as horizontal and tubular skylights. To conserve energy, the team implemented dimming daylight controls. These controls represent approximately 14 percent of the school’s total combined energy cost savings. In addition to these three major enhancements, the team implemented many other energy-efficient strategies throughout the school, including the following: reduced fan system power; high-efficiency, air-cooled chiller; condensing gas boiler; heat recovery; improved wall and roof insulation; cool roof; high-performance glazing; and vacancy and occupancy sensors. When combined, all these solutions reduced the school’s energy costs by 25.9 percent. 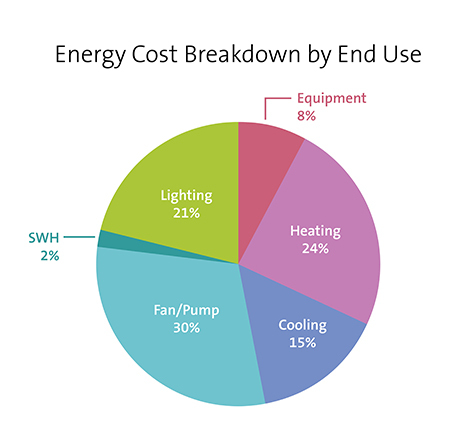 The end use breakdown of the energy costs is shown in the graph above. In recognition of these efforts, RMDS achieved LEED Silver certification under LEED for Schools in October 2015.